Walnuts have been used as ornamental containers for miniatures and as handmade Christmas ornaments and decorations for a very long time. The most common uses include as hulls for miniature sailboats, as cradles for mice or other small animals, or as backdrops for tiny miniature scenes, especially those made of simple or natural materials. The nuts can be left untreated, given a shiny coat of glaze, or silvered or gilded. For these purposes, the English walnut or Juglans regia is the preferred nut as it cracks open more easily and more reliably in two pieces than the black or American walnut. For ornaments which look like hooded cradles, crack the nut into two equal parts and then use a coping saw or razor saw to cut one half into the hood shape and glue it to the other half of the nut. 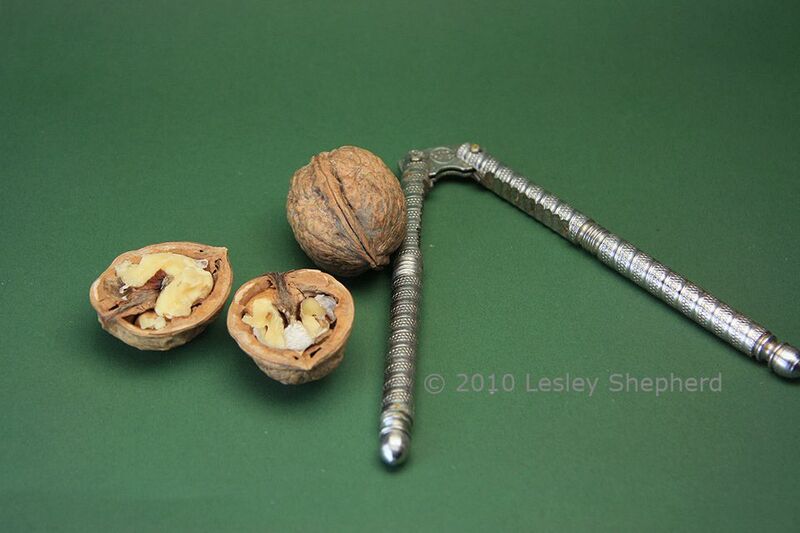 To Use Walnuts as Containers for Miniatures: you will first need to crack open the nut along the 'seam 'line. Use nuts from the current year's crop which have had their hulls removed. You will need a nutcracker to ease the nuts open, the simple straight 'plier' type shown in the photo above is the easiest and least expensive to find and use. Try to find ones that have a flat, slightly ridged surface that grips the nut. It will make it easier to apply even pressure to cause them to split. Antique Silver and Gold Walnuts: Walnuts made from silver and gold were small decorative boxes in Victorian times, often holding a vinaigrette, a small pierced container that held a sponge soaked in vinegar and scented oils, to act as a personal air freshener. Silver half walnuts were also used as salt cellars, and mustard pots or opening silver walnuts could be jewelry boxes, even a silver walnut tea ball. Something about the shape of the nut and the way it divides makes it very appealing as a hinged container. Gilded and Silvered walnuts were a common early Christmas tree decoration in Victorian times. To use walnuts for miniature cradles, boxes and Christmas ornaments they must be carefully split in half along the seam line of the nut. Most English walnuts placed correctly in a two-armed nutcracker and given gentle and even pressure will crack evenly in two along the seam. There are always some which are the wrong size or shape to work with the nutcracker, so be prepared for some splitting failures. Placing the Walnut In the Nutcracker: Fit the walnut carefully between the arms of the nutcracker so that the pointed end of the nut is facing the top of the nutcracker and the seam line is centered on the flat edges of the nutcracker arms. If the nut fits into the nutcracker so that the arms of the nutcracker start to apply pressure at the widest part of the nut, you will likely succeed in cracking the nut evenly in half. If the arms of the nutcracker are too far forward of the nuts widest section, you will have to take care to gently cradle the nut with one hand so that it doesn't move as you apply pressure with the nutcracker to make the seam open. With the nut properly lined up in the nutcracker, gently squeeze the arms of the nutcracker until you hear the nut begin to crack. Stop and check to see where the seam is cracking. With any luck, the pressure you applied to the nutcracker with the walnut in the correct position will cause the nutshell to begin to start to crack in half from the pointed end down towards the center of the nut. As soon as you hear or notice the seam opening, check that the nut isn't slipping in the arms of the cracker but is still lined up with the seam centered on the arms of the nutcracker. Continue to apply gently even pressure to the nut using the nutcracker to keep the seam line opening. Try to make sure you are pressing evenly on both arms, squeezing them together in your hand. If you apply too much pressure on one side, you may cave in the nut where it touches the nutcracker. Use the hand not holding the nutcracker to cradle the walnut in position as you apply pressure. If the walnut shell begins to 'give' under the pressure of the nutcracker, try reversing the walnut in the nutcracker arms so that the rounded bottom of the nut is facing the top of the nutcracker. Most nuts will crack in one press with the nutcracker, but some more stubborn or larger nuts may only crack half way and then begin to give rather than open. When you have successfully opened the walnut into two even halves, then gently remove the walnut meats and clean out the inside of the walnut to prepare it for use as a miniature ornament or container. This handcrafted ornament made from a walnut shell features an owl made from air dry clay, perched on a backdrop of natural materials. To make the ornament, make a simple owl shape from air dry clay and press your fingers gently into the owls head to make two dishes for its eyes. Use a toothpick or a small tool (or beads) to make eyes in the center of the dished area. Use a toothpick or craft knife to make feather or wing markings on its body. Set the owl aside to dry. Glue some natural materials, a bit of moss or lichen, some dried flowers or tiny cones into the half walnut shell as a backdrop setting the walnut shell, so the pointed end faces up. Tie a knot in a piece of gold sewing or embroidery thread or ribbon, and glue it underneath the pointed end of the shell as you can see in the photograph. When the owl is dry, glue it towards the front of the walnut shell. Two cute kittens sleep in this Christmas ornament made from a walnut shell. This is an easy ornament for a child to make. To make it you will need a half walnut shell, some thread or ribbon for a hanger, a scrap of fabric, a bit of cotton or quilt batting (makeup removal balls will work), glue, two kitten heads (can be made from air dry clay, polymer clay, or wooden 'buttons' and a round toothpick. Make the Kitten Heads: The kitten heads are easiest to make by rolling out two even rounds of air dry (or polymer clay) then gently flattening them, so they are slightly rounded. Make two tiny ears and glue them in place on top of the heads. Set the heads aside to dry or bake them to cure them. When they are completely dry, use a fine tip marker or drawing pen, or pencil, to mark the whisker lines, as well as tiny dots for their eyes and noses. You can add bits of clay or beads for eyes or noses if you wish before you bake or dry the clay. You can also make the kittens as shown here from wooden shapes. Slightly rounded slices of 1/4 inch wide doweling or rounded plastic buttons can be used for the kitten heads and painted with acrylic paints. Ears can be made from angle cut slices of a rounded toothpick. When you have assembled the heads, set them aside to dry while you make up the bed. To Make the Bed: Glue one end of a ribbon or thread hanger to the inside of the pointed end of the walnut shell. Fill the walnut shell with a bit of batting and cover the batting at the pointed end with a bit of fabric, turn the edges under and glue the fabric to the sides of the walnut shell. Don't cover the entire inside surface of the walnut shell, just the top third near the pointed end. Apply some glue to the underside of the kitten heads and glue them to the fabric, leaving a bit of fabric below the heads. Fold over a second slightly larger piece of fabric to make a sheet and glue it to the sides of the walnut shell so that the folded edge of the 'sheet' touches the bottom of the kitten heads. Glue the remaining free end of the ribbon or thread hanger to the wide end of the walnut shell and glue the bottom edge of the sheet over it. These simple cradles can hold all kinds of tiny animals, cats and rabbits are probably the easiest for children to make as they are just slightly squashed balls with different length ears. Make Gorgeous Glass Kitchen Cabinets for Your Dollhouse!